Quar’an explains about such things like Big Bang Theory: Evolution and whether it was by chance or planned: we also showed how the Holy Quran explains about the Human Embryology. How was it possible for the Holy Quran to mention these things 1400 years ago when scientists seem to have only recently discovered this knowledge? It proves that science actually supports and proves God’s existence! One of the greatest attacks on religion by the scientists is the time span of the world. 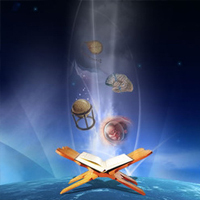 Accordingly to the Holy Books it explains how the world was created in six days and then God rested on the seventh. It further indicates that man has only been on this earth for around 5,000 years, but science has proved so far that it could not have taken only six days to create the Universe and that man has been around on this planet for at least 3.5 million years not 5,000 years. Therefore, they dismiss the Holy Books as fantasy not reality! First of all we need to understand what is a day? Are we talking about one of our days – 24 hours, if that is so, then God had to be living on the Earth when He created it? Unfortunately, the Sun couldn’t rise or set as He hadn’t created it yet! So when we are referring to one of God’s days, then it means a period, that period can be a day, month, year or even thousands, millions or billions of years. The Holy Quran mentions about a day (Yaum) as “a day with thy Lord is sometimes as a thousand years of your reckoning” (Ch.22: 48) or “The angels and the Spirit ascend to Him in a day, the measure of which is fifty thousand years” (Ch.70:5). So God’s day refers to an indefinite period or a stage in the development of a thing. Secondly, when you read about the story of Adam and Eve in the Holy Bible, then they had Cain and Abel, then Cain got married and lived in a city (Gen 4:17) so where did his wife come from? Where did the people of the city come from? If you read between the lines it indicates that there were many people around, this is why we say that Adam was the first Prophet not the first man, his Prophethood may have started 5,000 years ago, but man could have easily been evolving for the last 3.5 millions years until that reached a stage in their development when they started living in communities and so they needed the Prophet Adam to explain about God. The fact is that the Holy Quran abounds with facts which were impossible to know 1400 years without the aid of a microscope or telescope. Furthermore it has accurately prophesied future events. Some examples of these are related in the Holy Quran Chapter 81. Verse 4 – “And when the mountains are made to move – this could relate to when mountains will be blown away by dynamite and roads will be made through them. Verse 5 – And when the she-camels ten month pregnant are abandoned – this could relate to the fact that camels were the mode of transport in those days, but more better, faster and powerful means of transport will have been invented. Verse 6 – “And when the wild beasts are gathered together-this could relate to when animals will be collected in zoos. Verse 7 – And when the seas are made to flow forth one into the other – this could relate to the joining of two different seas, the Suez Canal joining the Red Sea with the Mediterranean Sea and the Panama Canal joining the Pacific Sea with the Atlantic Sea. There are many verses in the Holy Quran like these which seem to point to modern day discoveries and inventions, for instance another interesting verse relates about the hidden treasures as the Holy Quran refers to them, in Chapter 99 verse 3 it states “And the earth throws up her burdens”, it is a wonderful thing to note that whenever man needs a new type of energy it discovers a hidden treasure like coal, oil and gas, which has been lying hidden since before mankind was on the earth. Then when man needed greater power he discovered the splitting of the atom, again the atom has been around before mankind. No doubt you will find that when man is in need for another source of energy, it will discover another hidden treasure which was there before mankind! Therefore the answer to the question is yes, science fully supports the existence of God, Alhamdulillah Rabbil ‘Alameen (All praise is due to Allah alone, Lord, Creator and Sustainer of all the Worlds).